When we hear of Flea markets our mind maps a picture of street shops selling cheap stuff. However, lately the essence of flea markets has taken a toss. Read on to know what I am talking of. 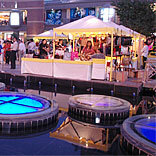 Flea markets which were once a street experience are now moving up the ladder of sophistication. The concept is now the representation of highly fashionable and expensive merchandise at a new high end address: Shopping malls. The kick of economic slowdown was witnessed a great deal by everyone but more so by mall owners. Shops were lying vacant with no retailers willing to take them. In a situation of discomfort, mall owners were working up on innovative ideas to woo customers and increase the customer traffic in their malls. Setting up weekly flea markets was just one of the ideas that clicked and is helping them to rake in the moolah. A flea is organised within the mall premises where people come together to organise a trading area that too in a short span of time. It is an opportunity for young entrepreneurs (usually exporters and designers) to showcase their talent and get a feedback before they further venture into full time retail. It can be termed as a brand exercise which upcoming retailers undertake to get a better picture for positioning their brand according to what the market actually desires. Flea markets cater to brands which are new and have a touch of freshness to their merchandise which is one reason that draws people to them. Also the surprise element and the excitement of witnessing something new is driving people to these flea markets. The flea markets have a carnival like feel to them making them an attractive and swank marketplace which attracts people. These markets are organised on weekdays rather than on weekends as the footfalls are already high and if there are add on flea markets as well, malls will face the problem of parking and managing. Flea markets have live bands playing with open grills to tickle people’s taste buds. At a flea you can shop across categories of books, pets, clothes, designer wear merchandise, footwear, bags, jewellery, toys, home linen, organic articles, items made by NGO’s, furniture and so on and so forth. You can also indulge in the charms of tarot card reading which is also gaining significance these days. NGO’s are also involved in the frenzy today. They are using the flea markets as a platform to sell articles made by their respective organisations. Earlier they used to put up exhibitions in schools and colleges, but as not much was advertised the client walk in was low. But as these markets are well advertised for, they have seen a rise in sales at these flea markets. Flea markets are the call of the day… For all budding retailers this is the best platform for experimentation. So go ahead and take the plunge.